The Silver Fox unmanned aerial vehicle has a maximum speed of 93km/h. Image courtesy of BAE Systems. The maximum take-off weight of the Silver Fox UAV is 13kg. Image courtesy of Photographer’s Mate 2nd Class Daniel J. McLain. The Silver Fox aerial vehicle is powered by gasoline engines/electric motors. U.S. Navy photo by Photographer’s Mate 2nd Class Daniel J. McLain. The launch rail assembly of the Silver Fox UAV. Image courtesy of BAE. Silver Fox is a small, tactical unmanned aircraft system (UAS) developed to meet a wide range of armed force mission needs. The drone’s mission capabilities include reconnaissance, intelligence, surveillance and target acquisition (RISTA), battle damage assessment, littoral operations, harbour security, convoy protection, and perimeter security. It can also be used for civilian applications such as research, scientific, monitoring, surveillance and security. The UAS was originally developed by Advanced Ceramics Research in 2001, in co-operation with the Naval Air Systems Command (NAVAIR) and the Office of Naval Research (ONR). Advanced Ceramics Research was acquired by BAE Systems in June 2009 and, four years later, BAE Systems’ Unmanned Aircraft Programmes business was purchased by Sensintel in June 2013. Raytheon Company acquired Sensintel in January 2015. In May 2016, Raytheon announced that the company increased production and deliveries of the Silver Fox UAS to meet the emerging warfighter needs. The Silver Fox unmanned aerial systems were deployed by the US Marine Corps (USMC) in Iraq to support reconnaissance operations in April 2003. The Canadian Armed Forces acquired the Silver Fox UAS in May 2004 for intelligence, surveillance and reconnaissance (ISR) missions. 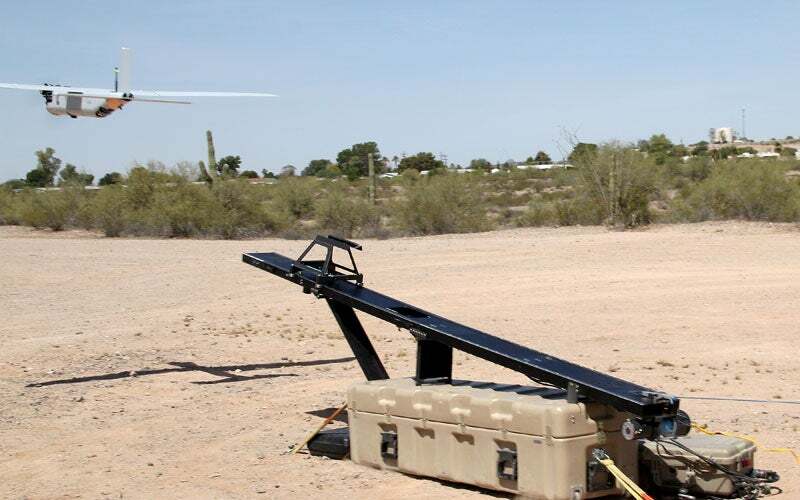 In September 2010, the US Air Force Research Laboratory (AFRL) awarded a $3.9m contract to BAE Systems to deliver engineering and training services for the Silver Fox drones. The Colombian Air Force conducted tests on the unmanned air system in 2006 and acquired three systems in July 2013. The Silver Fox UAS consists of an unmanned aerial vehicle (UAV), rail launcher, ground control station, video system, and transportation unit. The 1.47m-long, 0.28m-high UAV features lightweight, modular design, providing cost-effective and reliable operation. Equipped with detachable wings and tail fins, the aerial vehicle is capable of taking-off from and landing on remote, unimproved terrains. It is launched using a portable, closed gas piston rail system and landed by a net capture recovery system. The UAS has a wing span of 2.4m and a maximum take-off weight of approximately 13kg, and can carry payloads weighing about 2.2kg. It is transportable on a small utility vehicle or pick-up truck and can be deployed in 15 minutes. A payload pod attached below the fuselage houses small payload sensors including a stabilised, gimbal or fixed electro-optic and infrared (EO/IR) imaging system and a three-axis stabilised PTZ camera. "The onboard autopilot enables the UAV to fly autonomously from take-off to landing by following pre-programmed flight paths." The EO/IR camera provides high-resolution imagery and intelligence data in real-time under both day and night lighting conditions. The onboard autopilot enables the UAV to fly autonomously from take-off to landing by following pre-programmed flight paths. The real-time imagery and telemetry data acquired by the payloads is transmitted to an integrated ground control system (iGCS) through the satellite. The flight path can be altered by the operators at the iGCS using a touch screen display, on which the UAV flight parameters are displayed. Powered by gasoline engines or electric motors, the Silver Fox aerial vehicle can fly at a maximum speed of 93km/h. The engine drives a nose-mounted two-blade propeller. The drone has an operating range of approximately 37km and a service ceiling of 3,657m. It can endure for up to ten hours.